ARRA Editor: The following cartoon by A.F. Branco may be satire, but it truly relates the absurdity going on at the TSA (Totally Stupid Administration) and it needs to cease. Consider this: if the grandma had been a Berka dressed woman, she would have been waived through without further questioning. 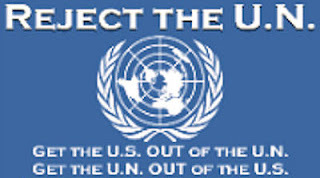 Besides the insanity of the actions being perpetrated on Americans, we are paying these people and the Federal government is already broke. I don't blame the people working at TSA, I blame the administration for their even being required or authorized to perpetrate such actions on our fellow citizens. Tags: A.F. 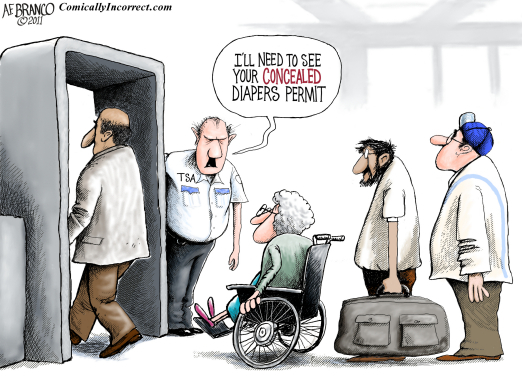 Branco, political cartoon, satire, TSA, diaper, seniors To share or post to your site, click on "Post Link". Please mention / link to the ARRA News Service. Thanks! The TSA is the principal reason I will not fly commercially unless absolutely required to get somewhere. In the USA, I'll drive, thank you. After many years within the FAA system, this disgusts me beyond discription. Me Too. Americans being forced to surrender to government harassment and control.